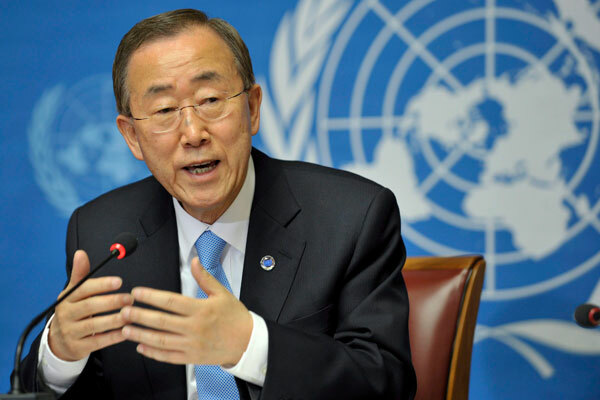 UNITED NATIONS, Aug 19 (APP): UN Secretary-General Ban Ki-moon has deplored the ongoing killings in Indian held Kashmir as security forces there try to stamp out weeks of anti-government protests by Kashmiri civilians, and urged India and Pakistan to settle Kashmir and other issues through dialogue. “I stand ready to offer my good offices, should it be requested by both sides, to facilitate dialogue in order to achieve a negotiated settlement,” he wrote in a letter he sent in response to a letter from Prime Minister Muhammad Nawaz Sharif apprising the UN chief about the deteriorating situation in Kashmir and the large-scale violations of human rights being committed by Indian security forces. “I deplore the loss of life and hope that all efforts will be made to avoid further violence,” the secretary-general said in his letter, obtained by Associated Press of Pakistan (APP). At least 70 Kashmiri civilians have been killed and thousands more injured in Indian held Kashmir in clashes with security forces after the killing of a prominent Kashmiri youth leader, Burhan Wani, in a military operation on July 8. In his letter of August 5, Prime Minister Sharif called for efforts to end the persistent and egregious violation of the basic human rights of the Kashmiri people and also to implement the decades-old UN Security Council resolutions providing a framework for the settlement of Kashmir dispute through a plebiscite. “I appreciated the continued commitment of Pakistan to the peaceful resolution of the Kashmir dispute for the sake of regional peace and security, as you reaffirmed in your letter,” Ban said in his letter. Pakistan has been actively pursuing the Kashmir issue at various forums at the United Nations, with Ambassador Maleeha Lodhi focusing on it in her statement at the General Assembly in a debate on human rights. She also raised the issue during meetings with the UN leadership as well as with the President of the Security Council last month.